USANNE (SUI) – The World Baseball Softball Confederation (WBSC) has awarded the North African nation of Tunisia the hosting rights of the first-ever WBSC Congress, which will be organised in Hammamet, Tunisia on the 10th-11th of May 2014. The Tunisian Baseball and Softball Federation, in collaboration with the Tunisian Ministry of Youth, Sports, Women and Family, coordinated the hosting bid. The historic inaugural WBSC Congress will unite all national governing bodies of the International Baseball Federation (IBAF) and the International Softball Federation (ISF) for the first time under the umbrella of the WBSC, as elections will be held to select all positions within the WBSC Executive Board, including that of the president. Never before has an IBAF or an ISF Congress been organised in Africa -- what is now a primary target of the WBSC's growth strategy to deepen baseball and softball's global footprint. With the decision to award the Congress to Tunisia, WBSC officials have confirmed the focus will be on those emerging territories with high potential for development, and where baseball and softball can be practiced to activate the youth demographic, promote gender equality, encourage greater universality and where the National Federations can build and reinforce their National Teams for international competition. "This is another key milestone -- across many levels -- for the global evolution of baseball and softball," said WBSC co-Presidents Riccardo Fraccari and Don Porter, "and we are not only honoured but we are particularly proud to have Tunisia as the host of the WBSC's very first Congress." In January, WBSC officials hailed the opening of Central Africa's historic first-ever national baseball and softball stadium in Uganda. WBSC's Fraccari and Porter noted that baseball and softball's union has resulted in increased opportunities and reach -- and has raised the potential legacy and value of WBSC's events so that new hosts like Tunisia are showing serious interest for the first time. "We are committed to growing the appeal and relevance of baseball and softball in emerging territories across Africa and around the world, and Tunisia's excellent bid is a key indicator that underscores baseball and softball's continued worldwide emergence and highlights the attractiveness, benefits and realities of baseball and softball's partnership," said the WBSC co-presidents. 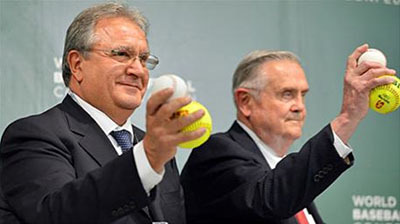 The WBSC became officially recognised by the International Olympic Committee as the sole competent authority for the administration of the sports of baseball and softball at the world level in September 2013, after congresses of the IBAF and ISF took a landmark decision in late 2012 to establish the WBSC as the single body to oversee baseball and softball. Since its establishment, the WBSC has been led by an interim Executive Board.